Presenting the Complete UME 2018 Lineup! 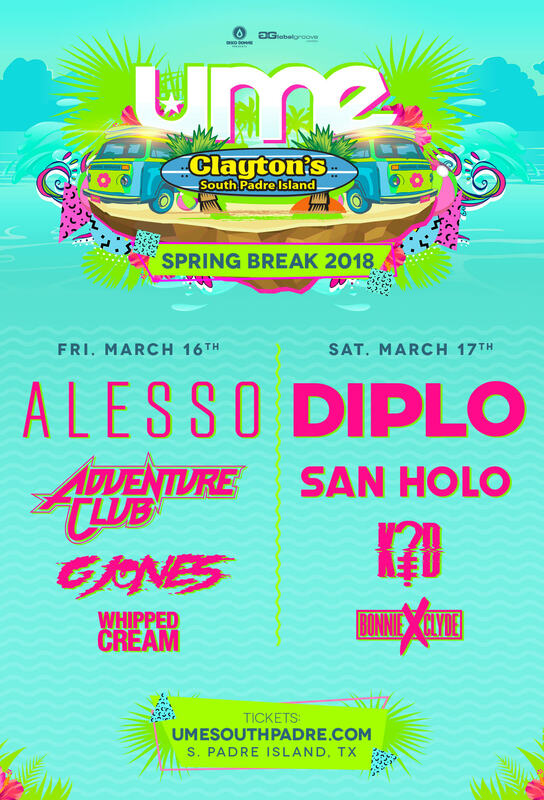 UME ’18 is set to wash ashore South Padre Island, March 16-17th, as spring breakers flock to its beaches, Disco Donnie Presents and Global Groove will transform the isle into a dance music paradise by night. The 8th annual event takes place indoors at Clayton’s with a variety of today’s most influential DJs setting the stage for this year’s adventure by the sea. Take a quick peek, or study up, because the Ultimate Music Experience lineup is here. Book your Spring Break getaway at UME, buy tickets now! Lock-in the Ultimate festivities for a marathon of fun, sand, and top-notch sounds as we welcome a sampling of the world’s finest players to take the decks. Peep the lineup including all-star performances from nightly headliners Alesso and Diplo. Catch shows by tried and true acts whose talents have been tested alongside valiant up-and-comers and emerging ones-to-watch. Check out the complete lineup including a diverse cross-section of house, bass, and everything in between. Land your trip at the lowest price, take advantage of ticketing options including payment plans for affordable monthly installments. Signup now!